Sushi usually contains raw food. It is not cooked. Raw things are full of bacteria, and sometimes parasites, because animals have those things in their tissue. Sushi can get you sick. This should not be a surprise. But still, everyone is surprised. Here they are, being surprised. Would you like to know what they are surprised at? They are surprised that one man in Portugal got sick from eating sushi once. They are not surprised at a trend. They are not surprised at a disease epidemic. They are surprised because a new British Medical Journal case study describes a single man in Portugal—for most news, a foreign country—getting sick once. And they are surprised because there’s a creepy picture of a worm, specifically a parasitic nematode in the genus Anisakis, in that article. 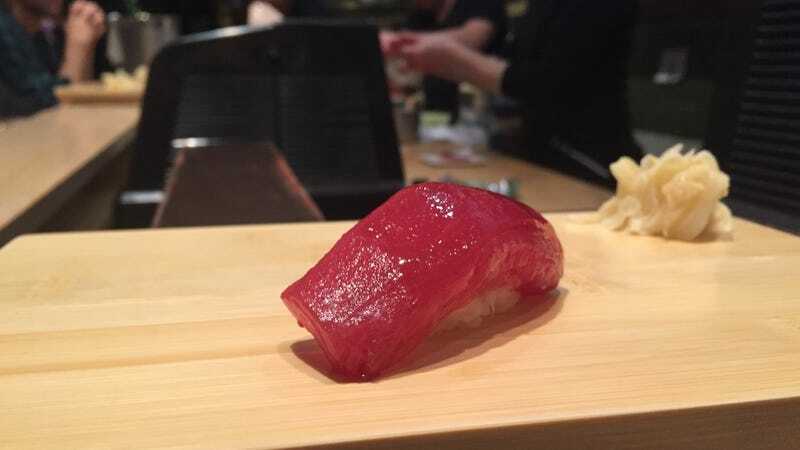 One person getting sick from sushi should not be surprising, because sushi usually contains raw fish. Scientists already knew that raw fish could contain the parasite that causes the disease anisakiasis. You already know that raw fish can get you sick. Yet another 2017 study found that most European cases of the parasite came from marinated anchovies, not sushi. Sure, sushi-loving Japan seems to account for most cases of the parasite worldwide. But I can’t find a single shred of scientific evidence linking increased sushi eating in “the West” to increased cases of the parasites, especially in the United States or Britain where many of the news outlets reporting this story are located. If you find anything else telling, please post it in the comments. In United States there were only 60 reported cases of anisakiasis ever according to a 2010 study (though this could be underreported). And a few months ago, on a whim, I filed a Freedom of Information request on food poisoning complaints made to New York City’s 311 line. Of the 21390 complaints made between February 1, 2012 and February 1, 2017, only 276 of them mentioned sushi. That is around 1 percent. Only one percent of NYC’s food poisoning complaints come from sushi. Literally everyone, calm down. You know what you’re getting into when you eat raw fish. And the odds are heavily in your favor that you will turn out fine.